Available for the .50 Caliber, Black Powder & Muzzle Loader. Easy to use. 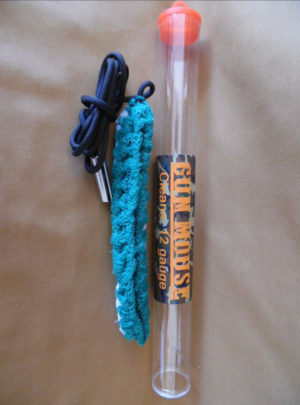 It is a nylon scrubby for your gun. The Gun Mouse captures loose debris and fouling without scratching the inside of your gun. 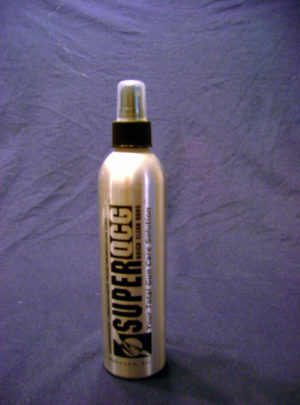 Use your Mouse with Super Quick Clean Guns Cleaner for a Super clean that will protect your gun for years to come. 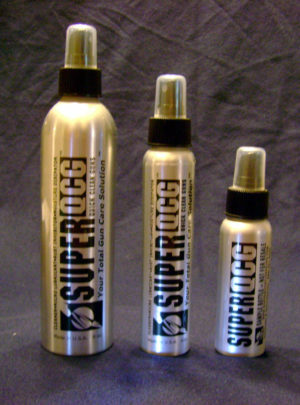 SQCG is your protectant, solvent, cleaner and lube all in one. This is an unbeatable combination when it comes to cleaning and protecting your guns. 100% guaranteed to work. 4 sprays of SQCG on your Mouse, and pull it slowly through your bore/barrel. Colors will vary. Choose your size with confidence. What is a Gun Mouse? This is an alternative to all the other bore cleaners/snakes out there. 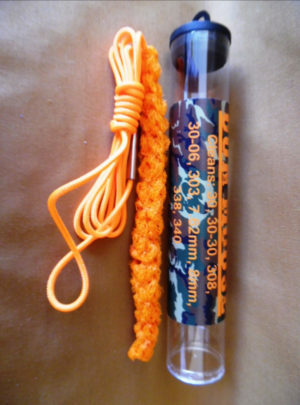 Compact and abrasive enough to do the job, but it will not hurt your gun with our specialized nylon scrubby material. There is No need for patches, no rods needed to do a thorough job. 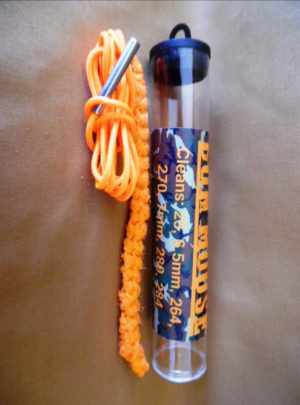 Just use our Gun Mouse from beginning to end and you will feel the power of the nylon Scrubber. Our product has thousands of pores to grab and hold all that loose debris and fouling, and not allowing it to escape all the way through your bore. 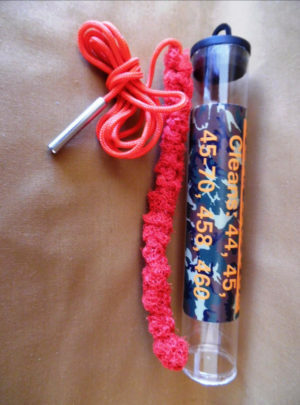 Take the Gun Mouse out of the protective tube and GIVE IT A SHOWER… spray/spritz, the fat end (The Body) 4 – 5 times with SQCG (Super Quick Clean Guns) care solution, and then simply feed the TAIL the weighted end, through the breach, and when it comes out the muzzle end then grab the (tail) weight and the string and pull the Gun Mouse slowly through for a Squeaky clean bore. Cleaning will never be easier, more effective, or quicker. Then just put your mouse back into the protective sleeve and cap it and you are good to go until the next cleaning. How do I clean the Gun Mouse? We recommend that you squirt it with SQCG, work the solution into the Gun Mouse and then wipe the Gun Mouse off with a clean rag and all the fouling and dirt will come right off. Your Gun Mouse is ready for use again. Replace your Gun Mouse back into your protective sleeve put the cap back on and you are done. Your Gun Mouse is now ready for the next time you need to clean your firearm. How do you prevent the Gun Mouse from breaking in my bore? 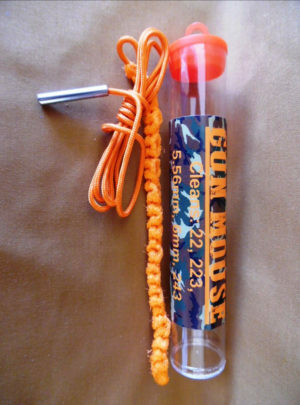 The Gun Mouse is sewn from the top to bottom with our specialized thread so breakage inside the bore doesn’t happen. We also use a para cord as the pull cord. Built strong and tested by our inspectors. So no matter what firearm you use it on rifle, handgun, shotgun, pistol, black powder, machine gun or cannon. You can pull Gun Mouse with total confidence that our tail will not separate from the body…! IT IS IMPORTANT THAT YOU USE THE PROPER GUN MOUSE FOR THE CALIBER FIREARM YOU ARE CLEANING. IF YOU USE A GUN MOUSE WHICH IS BIGGER THAN THE CALIBER FIREARM YOU INTEND TO CLEAN AND YOU BEGAN PULLING IT THROUGH THEN STOP, AND USING A CLEANING ROD FROM THE MUZZLE END, AND PUSH IT BACK OUT. THE PROTECTIVE TUBE LISTS THE PROPER CALIBER THAT THE MOUSE IS DESIGNED TO BE USED IN. DON’T USE A FAT MOUSE IN A SKINNY HOLE….! This is a newer product. What guarantee can you give me? We have the best no hassle guarantee in the business. If you need to return your Gun Mouse for any reason…. just call us. 888-381-6162. Available for the .35, .350, .357, .358, .375, .380, 9 mm, and .38 caliber. Easy to use. 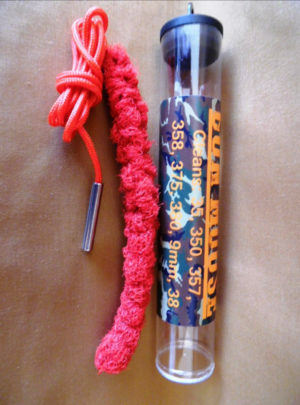 It is a nylon scrubby for your gun. The Gun Mouse captures loose debris and fouling without scratching the inside of your gun. using your Mouse with Super Quick Clean Gun, Cleaner for a Super clean that will protect your gun for years to come. SQCG is your protectant, solvent, cleaner and lube all in one. This is an unbeatable combination when it comes to cleaning and protecting your guns. Available for the 22, .223, 5.56, 6 mm, and .243 caliber. Available for 20 and 28 gauge shotguns. Available for the 25, 6.5mm, .264,.270, 7mm, .280, and .284 caliber. Available for the .30, .32,.308, 30-30, .30-06, .300, .303 caliber, 7.62 mm, 8 mm, .338, and .340 caliber. Available for the .44, .45, .45-70, .458 and .460 caliber.